Cracking a whip against persons exploiting innocent children by making them work in factories, the district administration and the Labour Department today rescued 44 boys. The Bachpan Bachao Aandolan, a non-governmental organisation, claims that more than 1,200 children are working in factories in the district. Hopes of the Ludhiana Municipal Corporation to get funds from World Bank for some of its existing and proposed infrastructure development projects were strengthened after the visit of a two-member team to the city today. Eighteen more persons tested positive for dengue at city hospitals today. Of these eight are from Ludhiana district. Encroachments are rampant at Bhadaur House. After encroaching upon the roads, shopkeepers have started parking their vehicle on the incomplete Lakkar Bridge. A youth in his twenties was killed while six others, including two women, were injured in separate road accidents near Jagraon during past 24 hours. The industrial city is fast turning into a hub of white-collar crime. A day after the police busted a gang that was behind a multi-crore loan scam, the city police today booked a couple, who in connivance with the manager of a bank, had taken a loan on Rs 9.5 lakh on fake documents. The Panjab University Zonal Youth and Heritage Festival concluded today at the Khalsa College for Women with the hosts winning the overall trophy. 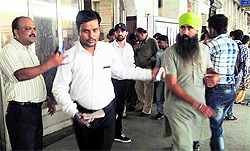 The Railway authorities have challaned more than 600 persons in an inter-divisional surprise checking at Ludhiana railway station. They were travelling without ticket and were violating other norms. The Excise and Taxation Department conducted raids on two factories and seized documents. The District Consumer Disputes Redressal Forum has directed IndusInd Bank to pay Rs 5,000 as compensation to an aggrieved consumer on account of mental pain, agony and harassment suffered by him. Non-filers of Income Tax be cautious as the Central Board of Direct Taxes (CBDT) has tightened norms to deal with "non-filers" of income tax returns and has also asked its officers to follow uniform procedure in handling such cases. Visitors to the Sub-Registrar’s office (East) were put to inconvenience as the official concerned (naib tehsildar) was not in his office till 1.30 pm today. Union Information and Broadcasting Minister Manish Tewari today lashed out at the Akali-BJP government in the state for imposing the property tax on the people of the state. “It simply amounts to picking pockets of helpless people to fill the empty coffers of the state,” he said, in a statement issued here today. "Had it not been for the youth festival, I wouldn't have known that such a wonderful dance form existed," said Arshpreet Kaur, after performing Marathi Gondal during the group dance competition on the concluding day of the zonal youth festival at the Khalsa College for Women. Drama dominated the scene while histrionics, skit, mime, mimicry, elocution, poetry and debate went side by side on the second day of Panjab University Zonal Youth and Heritage Festival being organised for the Zone-A colleges of Ludhiana at Guru Nanak National College here. Ahead of the Parliamentary polls, MCPI (U), during its state-level meet at Doraha, pitched for ‘alternative front’ based on alternative economic policies. Ruling out any coalition with the two major political parties, BJP and Congress, the leaders said the left democratic parties should come together on a common platform. The craze for vanity numbers among city residents refuses to die down, as series PB 10 DQ, 0001 was sold for Rs 4.10 lakh at an auction today. A delegation of CICU and other Industrial Associations held a meeting with the chairman, Punjab Pollution Control Board (PPCB), to bring down the pollution level in the city. A welcome function was organised to greet the newly-admitted students of the College of Basic Sciences and Humanities (COBSH) of the Punjab Agricultural University (PAU). Diverse themes of concern such as heal the earth with love, corruption, female foeticide, terrorism, deforestation and inflation were highlighted during the programme. The Treasury Department today cleared and released the salaries of around 500 teachers of the aided schools in the district that were pending for five months. Ludhiana: Students of Penguin Castle Preschool, Udham Singh Nagar, learnt about the working of postal services. They were told how a letters were collected from a letterbox, taken to the post office, sorted out and delivered by the postman. The children posted handmade postcards addressed to their parents in a replica of a letterbox put up in their classroom. The school would deliver these postcards to their parents, said school director Kamal Preet Kaur. On the occasion of International Elderly Day, a state-level programme dedicated to the elderly people will be organised on October 1 at Government College for Girls. This was informed by the social security officer, Inderpreet Kaur. The Khamano police has arrested a person at a naka near Kalewal village and recovered as many as 800 tablets of Phenotil from his possession. The accused has been identified as 21-year-old Jatinder Singh, a resident of Sanghol. The city police today arrested two drug peddlers and seized 40 gm of heroin and 90 gm of psychotropic powder from their possession. Another feather was added to the cap of Sher-e-Punjab Sports Academy, Chakar, near Jagraon when Karandeep Singh, a trainee of the academy clinched a gold medal in the 46th Punjab Junior Boxing Championship. The event was organised at Guru Nanak Model Senior Secondary School, Doraha.